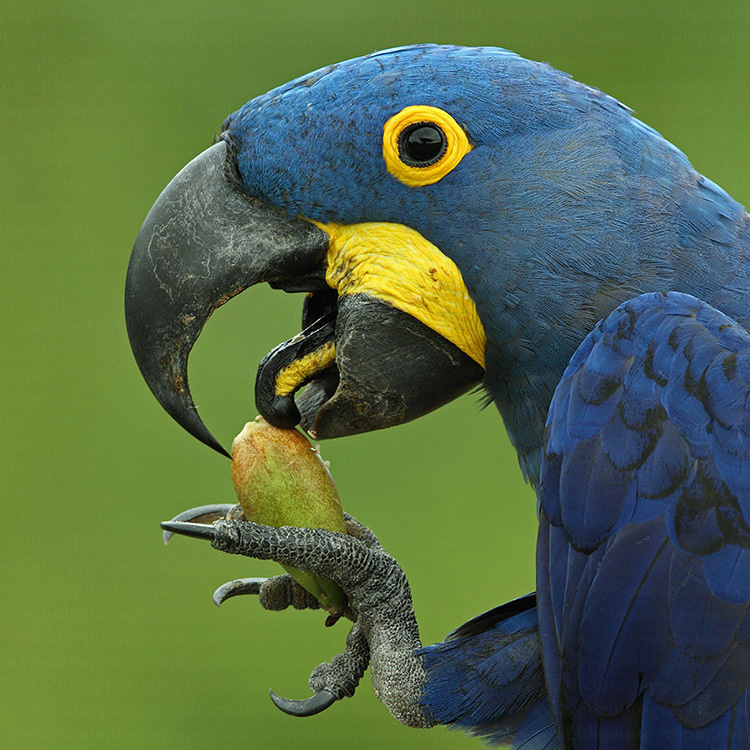 Here is a hyacinth macaw eating a nut. I hope that it didn’t come from a cow’s poo. Today I want to write about one of the most beautiful blue birds in the world, the hyacinth macaw. They are the longest parrots in the world, measuring up to 1 metre long. They have a very powerful beak for eating native nuts from the acuri and bocaiuva palms. However, the acuri nut is so hard that they can’t eat them until they’ve been eaten by a cow and been pooed out. Hyacinth macaws lay two eggs in tree cavities or on cliff faces, but most of the time only one chick survives to become an adult. They live in savannah grasslands and dry forests in Brazil, Bolivia and Paraguay. These beautiful birds are endangered, mainly due to poaching for the pet trade and loss of habitat. Are there any other interesting facts that you would like to share about hyacinth macaws? its horrific and im sending a letter to banky moon about endangered animals. BY THE WAY,Macaws eat a variety of foods including seeds, nuts, fruits, palm fruits, leaves, flowers, and stems. Wild species may forage widely, over 100 km (62 mi) for some of the larger species such as Ara araurana (blue and yellow macaw) and Ara ambigua (great green macaw), in search of seasonally available foods. Amazon parrots, together with macaws and the African grey parrot, are all known for their exceptional vocal abilities, playfulness, and dexterity with their feet. Well-trained parrots can be loyal companions, and they can live for 50 years or sometimes more in captivity.BYEEEE.!!!!!!!!! THANKS FOR ALL YOUR TIME BYEE!! !